A charming boutique resort on the south coast of Barbados, Little Arches is nestled in a secluded bay and is specifically adults only. With a wealth of luxuries at your disposal and a stone’s throw away from one of the best and most pristine beaches on Barbados, this is truly one of the finest hotels on the island. Little touches go a long way and make your visit truly special. Intimate services is combined with individually decorated rooms, complimentary WiFi access, room service, concierge service and the use of a hospitality room. The freshwater swimming pool is a haven for relaxation, or soak up the rays on the sun terrace – complete with chaise lounges and beach chairs. With attentive staff bringing you chilled face towels and a host of spa packages on offer; you are guaranteed to leave feeling totally rejuvenated. 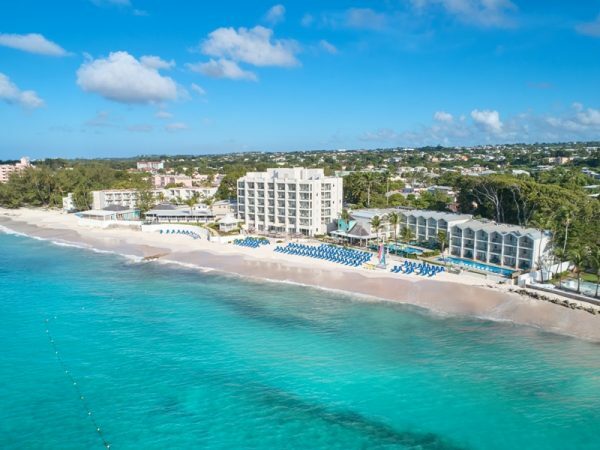 With a great selection of water sports on offer at the beach, golfing opportunities at a championship course at the Barbados Golf Club, bicycle tours and rides around the surrounding countryside, or just admiring the stunning views from the hotel’s very own rooftop restaurant and bar. A high standard of amenities and service, stunning location and a relaxed atmosphere mean Little Arches has won a series of awards and accolades over the years, including TripAdvisor’s Certificate of Excellence in 2011, 2012 and 2013, a spot in the top 25 Small Hotels Caribbean in 2013, and the Barbados Hotel and Tourism Associations award for luxury hotel of the year in 2010. This really is a stunning boutique hotel and guests find themselves going back year after year, isn’t it time you joined them? The accommodations at Little Arches are all individual and unique, with a distinctive tropical decor with hand-made touches, locally painted watercolours adorn the walls and imported Italian tiling lines the floor. There are luxurious king size feather beds, high quality cotton linen, air conditioning and fans, ironing facilities, kettle and coffee machine, mini-bar, safe, cable plasma TV and ipod docks, sitting area, private shower and custom pottery basins. There are also luxury bath and skin-care products, bathrobes and a nightly turn-down service included. Garden Standard – A cosy sanctuary to unwind in, with a four-poster king size bed, sitting area and bathroom with twin basins and shower. Ocean Deluxe – With Great views out over the ocean and either a private balcony or pool deck patio, these spacious rooms are all unique in size, layout and location. Boasting a four-poster king size bed, sitting area, mini-bar and full bathroom with shower and pottery basins. Poolside Deluxe with Partial Ocean View – Views to die for while you dine and overlooking the ocean, the deluxe poolside room has a four-poster king size bed, sitting area, mini-bar and bathroom with shower and pottery basins. Garden Jr. Suite with Whirlpool – With private garden decking areas complete with an oversized whirlpool tub, these spacious suites also have a four-poster king size bed, sitting area with its own sofa-bed and full bathroom with shower and pottery basins overlooking the resort’s tropical gardens and landscape. Luxury Ocean Suite with Private Plungepool – With a stunning Italian ceramic terrace, private plunge pool and a full compliment of luxury inside including a four-poster king size bed, sitting area with sofa-bed, dining area and the added convenience of a kitchenette. A bathroom with shower and pottery basins complete the package, the spectacular ocean views are merely the cherry on the cake. Café Luna – With a views to die for, the al fresco rooftop setting of the signature restaurant has a distinctive Mediterranean feel to it. A real taste sensation is inevitable with a delicate pan-tropical fusion of Caribbean, Asian and Mediterranean flavours, all overseen by Mark De Gruchy, the executive chef and co-owner of Cafe Luna. Serving Breakfast, Lunch and Dinner to in-house guests and open from 8am till 10.30pm. There is an elegant but casual dress code and reservations are encouraged. There is also a room service option available from 8am till 10.30pm, or if you prefer, the hotel is ideally situation 4 miles from the popular St Lawrence Gap, where a host of other restaurants and bars are located. The mini-spa is a garden-inspired treatment suite tucked away in a private and tranquil nook in the tropical gardens of the intimate boutique hotel. Deluxe signature treatments include the indulgent Lomi Lomi Hawaiian massage and our luxurious 110 minute Sensational Surrender. Indulge in exotic treatments in the most private of settings or enjoy in your room or even on the pooldeck at sunset. Up to 50% off, for travel is 2019! Up to 45% off, and the first child stays free.